Jules B have been dressing stylish men and women for over 30 years. Husband and wife team Julian and Rhona Blades opened their first Jules B store in the leafy suburb of Jesmond just outside the city center of Newcastle-upon-Tyne in the north-east of England in 1984. Since then more Jules B and Zen Wardrobe stores have opened in the north of England including Yarm, an affluent market town in North Yorkshire, and Kendal in the picturesque Lake District area of Cumbria – all of which have become prestigious shopping destinations, catering for an elite clientele of fashion devotees. In that time we have won the Drapers Magazine coveted title of ‘Best Independent Fashion Store’ an impressive four times. By constantly evolving to an ever-changing marketplace and driving the business forward, we have succeeded and continued to grow where many others have failed. 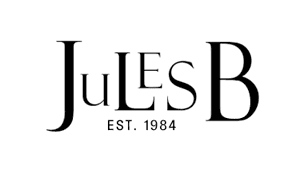 Investing early on in the Jules B website, when most fashion independents were still unconvinced of the Internet’s potential, was a bold move which proved to be the right one and www.julesb.ae continues to go from strength to strength. You can now find the complete range of designer clothing and accessories brands from all our stores under one virtual roof. We deliver to many places across the globe including the UK, Europe, North America and other selected international destinations. So wherever you are in the world, exclusive fashion from Jules B is just a click away. Our online team is dedicated to providing a shopping experience as unique and exhilarating as you would expect from any of our stores. We stock a roster of world-renowned fashion houses and designers for men and women including Vivienne Westwood, Gant, Paul Smith, Fred Perry, Hugo Boss, Canada Goose, Alexander Wang and Armani Jeans just to name a few. At Jules B our attention to detail extends throughout the stores – from brand selection and store interiors to the way your purchase is packaged. We also pride ourselves on personalized customer service – in-store and online – which is bespoke to the individual needs of the customer. We are committed to answering customer emails within 24 hours. during seasonal peaks this may take longer. However, our in-store teams are on hand Monday to Saturday to speak to for more detailed product information. At Jules B we believe that the experience of purchasing online should be as enjoyable and indulgent as shopping in one of our stores. Every query is a priority to us and a member of our team is always at the other end of the phone to assist you in any way we can. The world of Jules B is waiting for you!